Big Southland sprinter Eddie Dawkins brought the local crowd to their feet with a superb performance to win the keirin final at the UCI Festival of Speed event at Invercargill tonight. It is the first time New Zealand has hosted a UCI Tier One event which offers qualifying points ultimately to the 2016 Rio Olympics. Dawkins reeled in Olympic bronze medallist Simon van Velthooven, who went with two laps to go, and held off the former world champion Shane Perkins for the win at the SIT Zero Fees Velodrome. Young local rider Tom Beadle pushed ahead of van Velthooven to finish third. “It was so fast. The Aussies always push it to the limit and I felt like I had another gear in front of the home crowd,” Dawkins said. “Simon helped me out quite a bit by leading out early and gave me a nice rabbit to chance and keep the Aussies at bay. “I am really happy with how the week started and hopefully that success can carry on the other guys and push everyone to go faster. “I haven’t crashed well so that’s good,” said Dawkins who crashed twice at the recent World Cup in Manchester. Earlier both Dawkins and van Velthooven produced powerful bursts from the back of the field three laps from home to reach the front, and from that point they both controlled the race. Dawkins proved too strong while van Velthooven finished safely in second behind Australian Mitchell Bullen. World champion Aaron Gate holds a slender one point advantage after three events in the six-disciple omnium, finishing fourth in the 200m flying lap and second in both the 30km points race and elimination race. Adelaide’s Miles Scotson, 19, the current national Madison champion, rode the points race with speed and intelligence to win from Gate who put a lap on the field late in the race with the Australian to push up to second. Scotson had the edge over Gate in the final sprint to win the elimination with Southland’s Pieter Bulling third, while earlier Waimate 20 year old Dylan Kennett produced a personal best time to win the 200m flying lap in 12.895 seconds. Bulling holds third place on 14 points, four clear of Bulling. Meanwhile Mid Canterbury’s Lauren Ellis has the lead in the women’s omnium after three rounds. She finished second in the flying lap and the points race and won the elimination to be on five points, five clear of fellow Olympians Jaime Nielsen, 10 points and Rushlee Buchanan on 12 points. 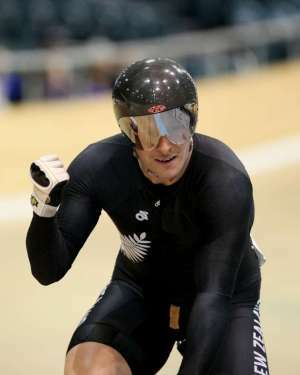 Nielsen from Hamilton produced a personal best to claim the honours in the 200m flying lap, the only rider under the 13 second barrier, while Buchanan took out the points race. Teenager Taylah Jennings upset Olympic team sprint medallist Kaarle McCulloch in an all-Australian decider in the women’s sprint. McCulloch, the fastest qualifier in 11.350 seconds, had no problems winning the first final and appeared to sit-up in the second. While edging out Jennings in the decider, she was relegated for not holding her line in the finishing sprint. Jennings continued her strong form at Invercargill after winning three titles at the world junior championships here last year. The UCI Festival of Speed continues tomorrow, with the four-day Oceania Championships beginning on Tuesday. Women Sprint, semifinals: Kaarle McCulloch (AUS) bt Rikki Belder (AUS) 2-0; Taylah Jennings (AUS) bt Breanna Hargrave (AUS) 2-1. Fifth-8th: Paige Paterson (AUCKLAND) 1, Katie Schofield (NZL) 2, Stephanie McKenzie (NZL) 3. Final: McCulloch bt Jennings 2-0. Men Keirin, Semifinal 1: Eddie Dawkins (NZL) 1, Andrew Taylor (AUS) 2, Shane Perkins (AUS) 3. Semifinal 2: Mitchell Bullen (AUS) 1, Simon van Velthooven (NZL0 2, Tom Beadle (Southland) 3. Final: Dawkins 1, Perkins 2, Tom Beadle (Southland) 3. 200m flying lap: Jaime Nielsen (NZL) 14.913, 1; Lauren Ellis (NZL) 15.062, 2; Elissa Wundersitz (AUS) 15.175, 3. Points Race 20km: Rushlee Buchanan (NZL) 20 points, 1; Ellis 16, 2; Liz Steel (Canterbury) 15, 3. Elimination: Ellis 1, Buchanan 2, Kelsey Robson (AUS) 3. Points after 3 rounds: Ellis 5 points, 1; Nielsen 10, 2; Buchanan 12, 3. 200m flying lap: Dylan Kennett (NZL) 12.895, 1; Scott Sunderland (AUS) 13.018, 2; Cameron Karwowski (NZL) 13.295, 3. Also: Aaron Gate (NZL) 13.498, 4. Points Race 30km: Miles Scotson (AUS) 62 points, 1; King Lok Cheung (HKG) 52, 2; Gate 48, 3. Elimination: Scotson 1, Gate 2, Pieter Bulling (NZL) 3. Points after 3 rounds: Gate 8 points, 1; Scotson 9, 2; Bulling 14, 3. Women Points, 10km: Bryony Botha (Auckland) 13 points, 1; Holly Edmondston (NZL) 8, 2; Nina Wollaston (NZL) 7, 3. Men Scratch: Alex Rendell (AUS) 1, Matthew Holmes (AUS) 2, Matthew Jackson (AUS) 3. Men Kierin: Michael Culling (NZL) 1, Matthew Jackson (AUS) 2, Jordan Castle (NZL) 3.